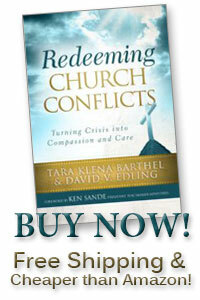 Destructive church conflict causes pain … to God. Of course, it causes pain to the people going through the church conflict too. But the pain of the antithesis to our faith is felt most by God. When his eternal children live in the church as if their faith made little or no difference, His warning, “If you keep on biting and devouring each other, watch out or you will be destroyed by each other (Gal. 5:15),” is tragically fulfilled. What does it look like when we respond to church conflict with an antithesis to our faith? What can now be seen trumps what is unseen. The temporal is of greater concern than the eternal. Self-interest supersedes the interests of others. Loyalty to a person is more highly valued than loyalty to Christ. The present is more important than the future. Angry venting feels more productive than controlling the tongue. The opinion of other people is more important than the opinion of God. Being a victim is more satisfying than being an overcomer. Fear of man is more terrifying than fear of God. Anxiety over possible outcomes takes priority over trusting God. Consider your current church conflicts. How are you living in antithesis to the very Christian faith you profess to believe? But there is one among us who loves the antithesis of faith that destructive church conflict is (Rev. 12:9). Q: I don’t understand what one person could possibly do to help in the midst of this terrible church conflict! A. You can be God’s instrument in redeeming your church’s conflicts by humbly depending on the Holy Spirit and following the biblical principles revealed in Scripture. Every church conflict can be redeemed because every church conflict can be used for genuine spiritual growth, both individually and corporately within the body of Christ. Christ can use you to redeem your church’s conflict—regardless of how other people respond, even if you are only one lay member out of hundreds or even thousands, even if you are only one leader out of many. You can be God’s instrument in redeeming your church’s conflicts by following the biblical principles revealed in Holy Scripture—in humble dependence on the Holy Spirit. In Scripture the starting point of instruction on right behavior is not a list of our duties, but a declaration of God’s saving achievement, bringing us into a relationship of favor with him. Dave and I were blessed to read an endorsement of “Redeeming Church Conflicts” by Pastor Whipple of Kossuth Street Baptist Church in Lafayette, Indiana. One of the most common emotions people feel when facing serious church conflict is hopelessness. Often this is because conflict puts blinders on our eyes and tempts us to isolate ourselves into self-protective groups who agree with us. In our passion to defend our position, we develop tunnel vision that clouds our judgment as we focus our time, energy and emotions almost exclusively on temporal matters. Things of heaven, theological truths about God and his church, even a passion for bringing the gospel of Jesus Christ to the unsaved, all begin to fade from focus as positions become entrenched in daily battles and we experience despair. I love his wording: “Helping entrenched people is what we do and who we are–after all, we are the church.” So wise! And sadly, so rare. Most churches just GIVE UP on people when things get hard. People become entrenched in sin. They are hurting, wandering, drowning … and their so-called “shepherds” abandon them. It doesn’t have to be that way! We can REDEEM our conflicts for God’s glory and our good. Please, God, help us to help entrenched people, rather than judging and rejecting them. Q. Sometimes, even in a mature church, a time comes when a servant-shepherd pastor must be let go. In this situation, how should the pastor and his family, and the other church leaders and members respond so that they can all work together to redeem this difficult situation? Those “servant-shepherd” pastors who are called to a life of humble sacrifice and suffering for their service, who are then persecuted for the sake of Christ’s righteousness (as described in Matthew 5:11-12) by being maltreated (and ultimately “fired”) by immature Christians in their churches (Part 2). Today’s post addresses a third type of situation—one in which a servant-shepherd pastor is appropriately let go by mature (wise, loving, God-glorifying) Christians. First of all, I fully recognize that these three groupings of people and situations may seem too restrictive. I readily admit that most situations are actually somewhere in-between on the spectrum: many pastors truly desire to serve as servant-shepherds, but they also recognize that their calling is also their “job” in that they provide for their families through the income they earn through the pastorate. I also recognize that many church members and leaders likewise fall somewhere in between “mature” and “immature” on the spectrum—they may (immaturely) be persecuting their pastor for worldly reasons and using secular causes and means for firing him; but often, there is a mix of godliness and maturity in the situation that causes these situations to be far more “gray” than I am describing in this series. So, with all of those caveats in mind (my lawyerliness is really showing today) … how ought we to respond when we (wisely and lovingly) discern that it is time for a pastor to leave a specific church? We ought to embrace God’s agenda for change and allow that change to produce holiness in all of us. Will that change be easy? By no mean. There will undoubtedly be uncomfortable moments in leadership meetings when new ideas are discussed or information is analyzed and everyone involved (including the pastor) will begin to have that uncomfortable sense that God may be leading their church in a way that is not a good fit for the current pastor. Hopefully, everyone involved will be prayerful and careful (full of care) as small discussions begin to grow into larger discussions. Communication with other leaders (for example, elders to deacons or council members to bishops) will be intentional and clear. At all times, people will hold firmly to the standard set for speech in Ephesians 4:29—edifying, bringing God’s grace. There will be no gossip or slander. Love for God and neighbor will be the defining mark of every meeting, announcement, and decision. The pastor will never be gracelessly criticized. Instead, every person will guard him, build him up, and help him (and his family) to transition to his new pastorate. Making us holy is God’s unwavering agenda until we are taken home to be with him. He will do whatever he needs to produce holiness in us. He wants us to be a community of joy, but he is willing to compromise our temporal happiness in order to increase our Chrislikeness. Wise and mature pastors, leaders, and members will recognize that this pastoral change is part of God’s plan for producing holiness in His eternal children. They will respond with light—truth, healing, beauty, compassion, and care—because their life goal is to reflect all of the characteristics of their Lord and King, Jesus Christ. But others? Sadly, they will respond with darkness—lies, distortions, relational injury, ugliness, judgment, and betrayal—because even though they claim to live for Jesus and His glory, they are ultimately motivated by their own selfish desires. They are willing to sacrifice the unity of the saints to fulfill their agendas. They do not pick up their cross and lay down their lives for their friends. But even then, the wise and mature Christian will see even these attacks of darkness as opportunities to model Christlike humility and love because how we fight in the church differs significantly from how the world fights. Or it ought to. How can we please and honor the Lord in this situation by respecting and honoring His under-shepherd, our pastor, even though we agree he should leave this church and continue his ministry elsewhere? How do we guard our own hearts and minds through all of this so that our trust in God for our church (His church) is evident to everyone? How can we continue to fulfill our duty to render “double-honor” (1 Timothy 5:17) to our pastor by meeting all of his and his families’ worldly needs during the transition period? How can we best work with our pastor to help him continue his ministry during the transition period and into his next assignment in the Church (note the capital “C;” the Church is much larger than any one local congregation)? How can we utilize pastoral change as an opportunity to help our immature brethren grow in Christ? How can we guard the pastor’s family from harmful gossip and speculation? As needed, how can we best use God’s plan of accountability (church discipline) to build his church by correcting the sinful behaviors of those acting in a manner inconsistent with their own profession of faith? How can we bless our present pastor by ensuring that we call another true servant-shepherd pastor to follow in his steps building on the foundation he has faithfully laid? How can we craft our pastor’s legacy of godliness as a model for future pastoral relationships? Praying for peace as we await “The Day” of The Shepherd’s return (Hebrews 10:25; 2 Peter 3:10)! If you’ve read last week’s blog, “How to Fire Your Pastor — Part 1,” then you know that its content only applies when the pastor is best characterized as a “hired-hand” (see John 10:12-13). In contrast, today’s post addresses the issue of letting a pastor go when the pastor is a true servant-shepherd. In these situations, there may be godly and appropriate reasons why he must leave. There could be compelling personal considerations, changing demographics, a difference of opinion or purpose that is not sin-driven but may reflect a differing philosophy of ministry, a humble recognition of the fact that the spiritual gifts of another may better serve the changing environment, etc. But, sadly, there may also be sinful reasons why the servant-shepherd pastor is being let go. The “firing” may actually be revealing spiritual immaturity in a few (or many) members of the flock. How does a servant-shepherd pastor redeem even his unjust firing for God’s glory and for personal and corporate spiritual growth? First, let’s consider the background for when a servant-shepherd pastor is sinfully fired (treated just like any employee at any old job). We live in a day and age when even Christians, having been conformed to the priorities and patterns of our loud culture through its incessant demands, forget they have been called to hunger for the things Jesus hungered for: righteousness, mercy, peace, humility, compassion, and justice, to name but a few. People conformed to the pattern of this world (see Romans 12:2) can lose focus and even become intolerant of a pastor who models Christ-like obedience and humility in their confused quest for greater “relevance” in the world. Whenever church people begin to measure the “success” of their pastor by making comparison with what passes as successful in this world, it is not unusual for persecution of the pastor to follow. How should a true servant-shepherd respond? A servant-shepherd who has preached, taught, and modeled Christ by manifesting all of the fruit of the Spirit does not respond to conflict with conflict. He responds with the message of redemption and reconciliation. The issues of concern that go by secular titles (“wrongful termination,” “due process,” etc.) seem trite and insignificant to the true servant-shepherd because he doesn’t carry concern for his “job” but, rather, is consumed with a passion for the souls of God’s sheep (who are also his sheep), even those souls seeking his dismissal. Having been called to the ministry by God, his vision is one of care and compassion even for (especially for!) the spiritually weak, confused, and immature. When immature Christians try to force a servant-shepherd pastor out of office, how will the other church leaders and members—those who are mature in Christ—respond? Will they look at their pastor and recognize the presence of grace and godliness in their midst? Or will they be taken over by worldly goals and patterns? And how about the pastor and his family? Will they confidently continue to trust in God, even in the face of persecution? Will they keep an eternal perspective and see God’s glory at work, even if their own personal story becomes one of being forced to leave the church on account of righteousness? Will they remember that how they respond to even this persecution is going to be a part of their lasting legacy at this church? And this presence reveals itself even when conflict comes to the church. I know these situations are frightening and often infuriating. This is exactly how an attack from a real wolf would be! If you are reading this and you just found out that you are being fired by your church, you are probably flooded with adrenaline and tempted to give in to fight or flight. Please fight this temptation with all of your strength! Don’t be afraid. Don’t be fooled. Stay the course! As needed, repent, confess, and change. But stay the course. Don’t stay merely to contribute to the conflict through self-serving defensiveness, but rather lead your people through the conflict by redeeming it for God’s glory and your (and God’s!) sheep’s spiritual growth. You can always leave later if that seems wise and would serve God’s interests, but first build a legacy of sacrifice that will leave a lasting impression and enduring memory that will change your sheep for their future in the church. Even foolish sheep, after all, need a model of what a true shepherd is like. And for the rest of the leaders and church members? Tune in next week to read my entry on how you should have dealt with your servant-shepherd pastor, rather than merely firing him in a worldly manner. To read part 3 of this “How to Fire Your Pastor” series, click here. To review part 1, click here. Q. Getting rid of a pastor can cause a lot of conflict. What should be happening for both the pastor and other church leaders and members when everyone is figuring out if the pastor should be let go? How should a church let a pastor go? Is your pastor a “hired-hand” (see John 10:12-13) or a servant-shepherd ready to lay down his life for God’s sheep? Is the tradition and history of the church to hire a man to lead by fulfilling a “position description” or is the attitude of everyone (pastor, leaders, and members) reflective of “calling” only God’s chosen under-shepherd who through supernatural spiritual gifting humbly models Christ by imitating His sacrifice? Is your pastor one who curries favor with people or one who pushes forward Christ and the Holy Spirit’s agenda while making nothing of himself? Do people of the church want a pastor who is popular by the world’s standards or one who is poor in spirit (MT 5:3), one who mourns (MT 5:4), one who is meek (MT 5:5), one whose hunger and thirst is for righteousness (MT 5:6), one who is merciful (MT 5:7), one who is pure of heart (MT 5:8), one who is a peacemaker (MT 5:9), and one willing to accept persecution because of righteousness (MT 5:10)? Has the church “filled the pulpit” with an appealing and clever orator or a man of godly character who is qualified as one who is above reproach, husband of one wife, temperate, self-controlled, respectable, hospitable, able to teach, not given to drunkenness, not violent but gentle, not quarrelsome, not a lover of money, a model manager of his own family, and one who has a good reputation with those outside the church (1 Timothy 3:2-7)? Is your pastor displaying evidence of the influence and fruit of this world (loud, pushing his agenda, seeking man’s approval, demanding his way, proud, arrogant, etc.) or the fruit of the Spirit: love, joy, peace, patience, kindness, goodness, faithfulness, gentleness, self-control (Galatians 5:22-23)? This post has two follow-up posts: parts 2 and 3. Q. Has there been one key similarity or common characteristic you have noticed about how Christians typically respond to conflicts in their churches? A. While always difficult to name just one dynamic given the complexity of church conflict, yes, I have observed a common trend in situations and that has been a lack of consistency between a believer’s faith and life. Let me explain. In church conflicts, I have seen this battle between belief and behavior, between faith and life, raging more violently than in almost any other arena. Caring Christians become deceitful schemers; brothers and sisters in Christ become engaged in doing harm rather than following what they say they believe: to “make every effort to maintain the unity of the Spirit through the bond of peace” (Ephesians 4:3). Evidence of inconsistency is everywhere but unseen, unappreciated. Many heart idols (those personal desires and agendas) that are revealed through harsh words and actions come to tower over Christ’s call for gentleness and “wholesome talk” (Ephesians 4:29). The beliefs that form the core of one’s profession of Christ are quickly compromised in favor of winning an argument. Paul asks the right (and best) question: Who will rescue me from this body of death?” And that, too, is the question we must ask when engaged in church conflicts. We must look for consistency. When there is a want of it we must suspect deception. Just as the fictional sleuth pursued the unraveling of crimes, we too are called by faith’s appeal for consistency to unravel the crime of church conflict. We are called to look for inconsistency in our own hearts and also help those of our eternal siblings in the church so that we may all put first things first. Inconsistency reveals deception—we must suspect it! And what is Satan’s prime work? Deception, of course! We have been called to “not give the devil a foothold” (Ephesians 4:27), and to “resist him, standing firm in the faith” (1 Peter 5:9). There is no more important task at hand when the church faces conflict. Who will rescue us from this body of death? There is only one—The Prince of Peace who lives—the One has been consistently calling us to “be self-controlled and alert” (1 Peter 5:8). Only by turning and returning again and again to the Gospel of Jesus Christ and all of its implications for faith/life, belief/behavior consistency have I ever seen church conflicts redeemed and biblically resolved. Getting everyone back to the basics of our faith is the first step. Consistency of faith (what we believe) and consistency of life (what we say and do) answers the key application question of our faith: “So What and Now What?” How we answer that is the evidence, the only evidence, by which we demonstrate that we know He, The Prince of Peace, lives and reigns. If you are presently involved in a church conflict search your heart for any inconsistency between what you believe and what you are doing in response to the conflicts. Are you making every effort to be a redemptive peacemaker? If not, repent and begin again by bringing forth the fruit of consistency. I have been writing this week, but it hasn’t been for this website. Rather, my efforts have been directed at writing a requested review of a new book for The Gospel Coalition. So, I was thinking of just taking the week off from blogging when I read a passage from a book I recently started that fits in my category of “relaxation/pastime” pleasures, a luxury I have afforded myself in my retirement years. The book is A Voyage for Madmen by Peter Nichols (HarperCollins Publishers, 2001) which is about the 1968-1969 non-stop circumnavigation of the world sailing race by nine solo yachtsmen. The book’s sub-title is: Nine men set out to race each other around the world. Only one returned. My brother and I used to have a vision of one day sailing from Bellingham, Washington to Bora Bora. He is a commercial fisherman and boat-builder and I am retired from the Coast Guard with both Navy and Coast Guard deep water sailing experience. I was once even the navigator of a U.S. Navy ship. We thought this would be a fitting adventure for our mid-60’s until both of our wives heard the plan. Now, we are not going and my brother sold his boat. Oh well! At least I get to live the vicarious life of reading about others who have taken to the high seas. I have to admit that differing from Chay, I was not out for merely the survival aspect of such a voyage…I expected to survive and have some serious fun along the way. How many pastors feel exactly like Chay when the gale waters of conflict hit their church? Yes, they pray. And then they turn to the many “manuals” to see what advice they may contain…but how often do they feel that they are “in hell with instructions”? Having worked with a significant number of conflicted churches, we know that church conflict can feel very much like a foretaste and glimmer of “Hell” … so the analogy is apropos. Of course, Chay’s problem was that he didn’t learn how to sail through rough and stormy waters before he left port on such an adventurous undertaking. That should never be the case in the church as regards conflict. Pastors, other leaders, and every church member have time to prepare for the looming storm of church conflict. In Redeeming Church Conflicts we warn readers to prepare before the high winds of conflict begin to swamp the hallowed halls (and every relationship is at risk of being washed overboard). 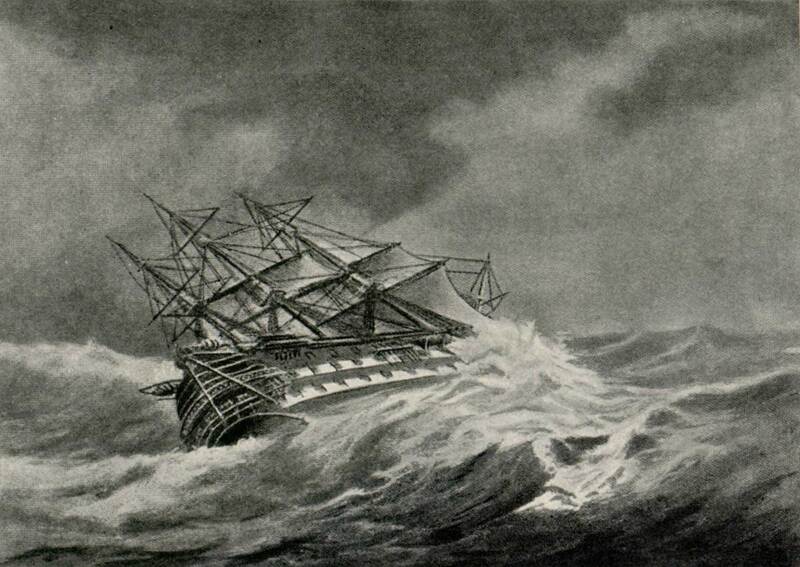 Don’t wait to read the “manual” until the turbulent times are sinking your ship…read and prepare now! Don’t be like Chay! As of my reading this morning, I don’t know yet how Chay fares in the race he has entered. I will finish this book and discover the ending in a couple of days. But I do know that if you, as a pastor, church leader, or church member, don’t prepare for the voyage of church conflict before it strikes the bow, stern or amidships of your church, you will broach. Therefore, you must enter the race prepared! In my years of serving as a Christian mediator, I have been privileged to assist extraordinarily gifted men and women of great faith and world-class formal educations. In one such situation, I was sitting between two (very angry) co-senior pastors of a large suburban church. Both loved the Lord and loved their church—but their years of subtle maneuvering for the position of greatest power and influence over their members had brought about a terrible result. Their relationship was nonexistent. It had been months since they had even prayed with one another. And the church was crumbling beneath even these “gifted,” “brilliant” men. One pastor responded to the most recent point made in our four hour stretch of meditating on Holy Scripture. He flung at me and his opponent. Not with gratitude (“Thank You, Lord, for allowing me to see You and Your Truth in Your Word”), but as a weapon to attack, a wall to hide behind, a way to proclaim his superior knowledge of God’s Word and put any hope of reasoned discussion to an end. May God give us grace to redeem every conflict for His glory as our wisdom—our love—is on display (not merely our knowledge). “The Facts: Barthel and Edling tackle a subject most would prefer to ignore yet all have to face. Drawing from their experience with Peacemaker Ministries, the authors face the reality of conflict within churches head-on, including the devastating effects unresolved conflicts have on congregants and mission. But this is ultimately a book about redemption. Hope permeates each chapter. Multiple case studies provide nice balance to the theology and advice. I truly believe that Redeeming Church Conflicts would be needed much less if we all lived out the truths that Pastor Anyabwile exegetes in this book.